I am a Brit. I'm also an immigrant, non-citizen living in California and I spend way too much time trying to understand America and Americans. Apple Pie, cowboys, racism, Independence, Hollywood, freedom of speech, guns, social justice, Disney, country music, confidence, straight teeth, eagles, slavery, ignorance, innovation, incarceration, money, Jesus. That doesn’t answer the question. But it does demonstrate that America is all things to all the people living in it and those people are massively different. So when I saw that PBS had commissioned YouGov to poll Americans and find their 100 favorite books I was instantly intrigued. 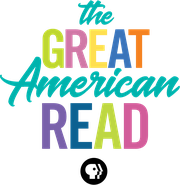 The resulting list is the basis of a tv show called The Great American Read which producers hope will spark reading and conversation about books. This is a noble cause and one for which (as a bookseller), I am grateful. Then I read the list. The list makes NO sense at all. British and Russian classics sit next to contemporary YA series while second tier works by great contemporary authors vie with Christian and Buddhist morality tales. And then there’s Ghost, by Jason Reynolds. I love it, but I don’t know how it got here. The list is exactly like the random list of Americana above. I have a degree in English Lit. from a UK university and I’ve been an bookseller for 15 years, but at the time the list was published I’d only read 24 of these 100 titles. So I’m going to read the list, (or at least most of the list). This isn’t an attempt to enrich my life by reading more. I already read 10-20 books per month. Instead I hope this will help me understand America through reading what Americans love, or at least, what they claim to love. Every time I finish reading a book from the list, I’ll write a little something about my gut reactions to it and my thoughts about how it got on the Great American Read list.